Good news! Grab is working with many major companies to increase rides for you! DO NOT CANCEL the ride so that it is a good experience for the passenger and more companies want to be on board. DO NOT COLLECT any payment from the passenger. Grab will pay entire fare to your BANK ACCOUNT within 1-3 working days. Receive an SMS from Grab. Step 2: Click ‘Drop Off’ when you’ve arrived at destination. Step 3: Key in fare as normal (including ERP, surcharges) and click ‘Submit’. Step 4: Grab will pay entire fare to your BANK ACCOUNT within 1-3 working days. I didn’t receive an SMS to highlight about this job. This means it is not a corporate ride. What if I do not receive payment after 3 working days? C.If you do not see it, please email or call customer centre to double check. 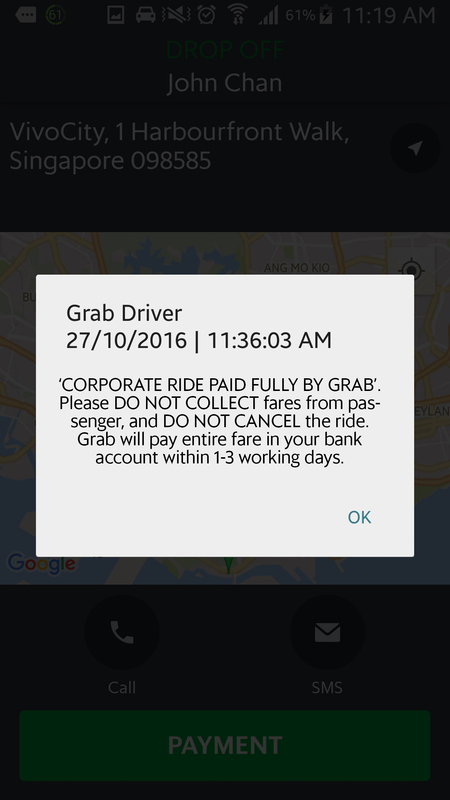 What if the Passenger claims to be a corporate but I do not see the message – ‘CORPORATE RIDE PAID FULLY BY GRAB’? Please show passenger your driver app and let them see that you do not see this message – most probably they forgot to key in the code. Ask them to pay for the ride. If there are any dispute, please request for the corporate to check with their company’s administer.